For other uses, see Dolmen (disambiguation). A dolmen (/ˈdɒlmɛn/) is a type of single-chamber megalithic tomb, usually consisting of two or more vertical megaliths supporting a large flat horizontal capstone ("table"), although there are also more complex variants. Most date from the early Neolithic (4000–3000 BC). Dolmens were typically covered with earth or smaller stones to form a tumulus. In many instances, that covering has weathered away, leaving only the stone "skeleton" of the burial mound intact. It remains unclear when, why, and by whom the earliest dolmens were made. The oldest known dolmens are in Western Europe, where they were set in place around 7,000 years ago. Archaeologists still do not know who erected these dolmens, which makes it difficult to know why they did it. They are generally all regarded as tombs or burial chambers, despite the absence of clear evidence for this. Human remains, sometimes accompanied by artifacts, have been found in or close to the dolmens which could be scientifically dated using radiocarbon dating. However, it has been impossible to prove that these remains date from the time when the stones were originally set in place. The word dolmen has a confused history. The word entered archaeology when Théophile Corret de la Tour d'Auvergne used it to describe megalithic tombs in his Origines gauloises (1796) using the spelling dolmin (the current spelling was introduced about a decade later and had become standard in French by about 1885). The Oxford English Dictionary does not mention "dolmin" in English and gives its first citation for "dolmen" from a book on Brittany in 1859, describing the word as "The French term, used by some English authors, for a cromlech ...". The name was supposedly derived from a Breton language term meaning "stone table" but doubt has been cast on this, and the OED describes its origin as "Modern French". A book on Cornish antiquities from 1754 said that the current term in the Cornish language for a cromlech was tolmen ("hole of stone") and the OED says that "There is reason to think that this was the term inexactly reproduced by Latour d'Auvergne [sic] as dolmen, and misapplied by him and succeeding French archaeologists to the cromlech". Nonetheless it has now replaced cromlech as the usual English term in archaeology, when the more technical and descriptive alternatives are not used. Dolmens are known by a variety of names in other languages, including Irish: dolmain, Galician and Portuguese: anta, German: Hünengrab/Hünenbett, Afrikaans and Dutch: hunebed, Abkhaz: Adamra, Adyghe Ispun, dysse (Danish and Norwegian), dös (Swedish), Korean: 고인돌 goindol, and Hebrew: גַלעֵד‎‎. Granja is used in Portugal, Galicia, and Spain. The rarer forms anta and ganda also appear. In the Basque Country, they are attributed to the jentilak, a race of giants. 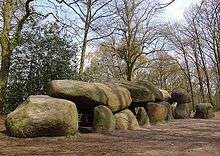 The etymology of the German: Hünenbett, Hünengrab and Dutch: hunebed - with Hüne/hune meaning "giant" - all evoke the image of giants building the structures. Of other Celtic languages, Welsh: cromlech was borrowed into English and quoit is commonly used in English in Cornwall. Korean dolmens exhibit a morphology distinct from the Atlantic European dolmen. The largest concentration of dolmens in the world is found on the Korean peninsula. With an estimated 35,000 dolmens, Korea alone accounts for nearly 40% of the world’s total. The largest distribution of these is on the west coast area of South Korea, an area that would eventually become host to the Mahan confederacy and be united under the rule of the ancient kingdom of Baekje at one time. Three specific UNESCO World Heritage sites at Gochang, Hwasun and Ganghwa ( Hwasun – 34°58′39″N 126°55′54″E﻿ / ﻿34.9775414°N 126.931551°E﻿ / 34.9775414; 126.931551) by themselves account for over 1,000 dolmens. The Korean word for dolmen is goindol (Hangul: 고인돌 ) "supported stone". Serious studies of the Korean megalithic monuments were not undertaken until relatively recently, well after much research had already been conducted on dolmens in other regions of the world. After 1945, new research is being conducted by Korean scholars. In 1981 a curator of National Museum of Korea, Gon'gil Ji, classified Korean dolmens into two general types: northern and southern. The boundary between them falls at the Bukhan River although examples of both types are found on either side. 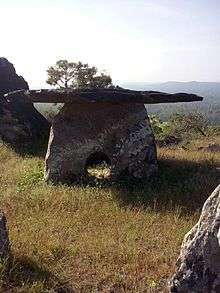 Northern style dolmens stand above ground with a four sided chamber and a megalithic roof (also referred to as "table type"), while southern style dolmens are normally built into the ground and contain a stone chest or pit covered by a rock slab. Korean dolmens can also be divided into three main types: the table type, the go-table type and the unsupported capstone type. The dolmen in Ganghwa is a northern-type, table-shaped dolmen and is the biggest stone of this kind in South Korea, measuring 2.6 by 7.1 by 5.5 metres. There are many sub-types and different styles. Southern type dolmens are associated with burials but the reason for building northern style dolmens is uncertain. Due to the vast numbers and great variation in styles, no absolute chronology of Korean dolmens has yet been established. It is generally accepted that the Korean megalithic culture emerged from the late Neolithic age, during which agriculture developed on the peninsula, and flourished throughout the Bronze Age. Thus, it is estimated that the Korean dolmens were built in the first millennium BC. How and why Korea has produced so many dolmens are still poorly understood. There is no current conclusive theory on the origin of Korea's megalithic culture, and so it is difficult to determine the true cultural character of Korean dolmens. Some dolmens are also found in Manchuria and the Shandong Peninsula. Off the peninsula, similar specimens can be found in smaller numbers, but they are often considerably larger than the Korean dolmens. It is a mystery why this culture flourished so extensively only on the Korean peninsula and its vicinity in Northeast Asia. 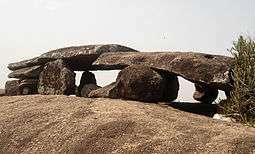 There are also dolmens in Andhra Pradesh, Karnataka, Kerala and Tamil Nadu in South India. In Karnataka more than 50 dolmens are identified on top of Pandavara Betta about 7 km away from Somwarpet towards Shaniwar Sante in Madikeri (Coorg) District. In Tamil Nadu more than 100 dolmens are identified in the Moral Pari near Mallachandram  located 19 km from Krishnagiri district, Tamil Nadu. Over 3,000 dolmens and other structures can be found in the North-Western Caucasus region in Russia, where more and more dolmens are discovered in the mountains each year. These dolmens are related to the Maykop culture. This great city of dolmens was built along the shores of the Black Sea from Maykop down to Sochi. The inhabitants were metal workers. The dolmens were vaults or safes of stone, with a narrow circular entrance that could be tapped with a round screw of stone. Supposedly the dolmens were used to hide and protect metal objects: gold, silver, bronze, jewels and some other treasure. Trade of these objects was done with Persia, Assyria, Egypt and Crete. The Dolmen City was pillaged and sacked by Scythian invaders in the early first millennium BC. The metal workers were enslaved. Dolmens can be found in Israel, Syria, Iran and Jordan. Numerous large dolmens are in the Israeli National park at Gamla and some of dolmens can be viewed in the meshkin shahr at shahr yeri or pirazmian. There are many examples of flint dolmens in the historical villages of Johfiyeh and Natifah in northern Jordan. The greatest number of dolmens are around Madaba, like the ones at Al Faiha village, 10 km to the west of Madaba city see Madaba dolmens on YouTube. Two dolmens are in Hisbone, and the most have been found at Zarqa Ma'in at Al-Murayghat, which are being destroyed by gravel quarries see where have all the dolmens gone? on YouTube . In northern Somalia, the town of Aw Barkhadle, named in honour of the 13th century scholar and saint Yusuf bin Ahmad al-Kawneyn, is surrounded by a number of ancient structures. Among these are dolmens, burial mounds, menhirs (standing stones), and stelae. In northern Tunisia, Dougga is an important ancient site, which contains a necropolis with dolmens. The settlement also features a sanctuary dedicated to Ba'al Hammon, neo-Punic stelae, the mausoleum, architectural fragments, and a temple dedicated to Masinissa, the remains of which were found during archaeological excavations. Megalithic tombs are found from the Mediterranean Sea, Baltic Sea and North Sea coasts south to Spain and Portugal. Hunebedden are chamber tombs similar to dolmens and date to the middle Neolithic (Funnelbeaker culture, 4th millennium BC). They consist of a kerb surrounding an oval mound, which covered a rectangular chamber of stones with the entrance on one of the long sides. Some have a more complex layout and include an entrance passage giving them a T-shape. Various menhirs and dolmens are located around the Mediterranean islands of Malta and Gozo. Pottery uncovered in these structures allowed the attribution of the monuments to the Ġgantija and Mnajdra temples culture of the early Neolithic Age. Dolmen sites fringe the Irish Sea and are found in south-east Ireland, Wales, Devon and Cornwall. 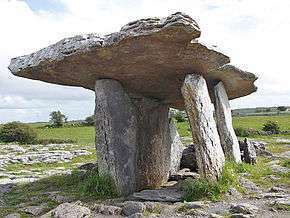 In Ireland, most dolmens are found on the west coast, particularly in the Burren—and Connemara, which includes some of the better-known examples, such as Poulnabrone dolmen. Examples such as the Annadorn dolmen have also been found in northern Ireland, where they may have co-existed with the court cairn tombs. Many examples appear on the Channel Islands of Jersey and Guernsey, such as La Pouquelaye de Faldouet, La Sergenté, and La Hougue des Géonnais. The term Houge derives from the Old Norse word haugr, meaning a mound or barrow. The most famous of these sites is La Hougue Bie, a 6,000-year-old neolithic site that sits inside a large mound; later a chapel was built on the top of the mound. In France important megalithic zones are situated in Vendée, Quercy and in the south of France (Languedoc, Rouergue and Corsica). Amongst the vast Neolithic collections of the Carnac stones in Brittany, several dozen dolmens are found. Across the country, several dolmens still stand, such as the ones of Passebonneau and des Gorces near Saint-Benoît-du-Sault. 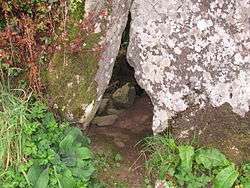 In Spain dolmens can be found in Galicia (such as Axeitos), Basque Country and Navarre (like the Sorgin Etxea) and the basque name for them is Trikuharri or Jentiletxe, Catalonia (like Cova d'en Daina or Creu d'en Cobertella), Andalusia (like the Cueva de Menga) and Extremadura (like "Dolmen de Lácara"). Dolmens can be found across Portugal, ranging from simple ones to more complex examples of megalithic architecture, such as the Almendres Cromlech or the Anta Grande do Zambujeiro. In Mecklenburg and Pomerania/Pomorze in (Germany) and (Poland), Drenthe (Netherlands), large numbers of these graves were disturbed when harbours, towns, and cities were built. The boulders were used in construction and road building. Others, such as the Harhoog, in Sylt, were moved to new locations. There are still many thousands left today in Europe. 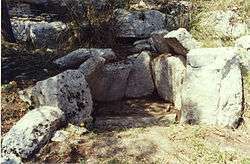 In Italy dolmens can be found in Apulia, Sardinia and in Sicily. In this latter region there are small dolmens located in Mura Pregne (Palermo), Sciacca (Agrigento), Monte Bubbonia (Caltanissetta), Butera (Caltanissetta), Cava dei Servi (Ragusa), Cava Lazzaro (Siracusa), Avola (Siracusa). In the area named Cava dei Servi was found an atypical dolmen, away from the trilithic characteristic shape; it's a semi-oval monument formed by four rectangular slabs fixed into the ground. Another three slabs are on top, leaning in such a way they reduce the surface and form a false dome; two large parallelepiped boulders complete the construction. In Turkey, there are some dolmens in the Regions of Lalapasa and Suloglu in the Province of Edirne and the Regions of KOfcaz, Kirklareli and Demirkoy in the Province of Kirklareli, in the Eastern Thrace. They have been studied by Prof. Dr. Engin Beksaç, since 2004. And also, some of so-called monuments are in the different regions of Anatolia, in Turkey. There are interesting dolmens in the regions related to the Sakar and Rhodope and Strandzha Mountains in Bulgaria. There is also a dolmen in Hore-Vranisht, Albania. It is locally known as "Guri me qiell" ("Stone in the sky") or "Sofra e Zotit" ("Table of the God"). The largest dolmen in Europe is the Brownshill Dolmen in County Carlow, Ireland. Its capstone weighs about 150 tonnes. Lanyon Quoit is a dolmen in Cornwall, 2 miles southeast of Morvah. It stands next to the road leading from Madron to Morvah. The capstone rested at 7 feet high with dimensions of 9 feet by 17.5 feet weighing 13.5 tons. ↑ Bakker, Jan Albert (2009). Megalithic Research in the Netherlands, 1547–1911. Sidestone Press. p. 36. ISBN 978-9088900341. ↑ Corret de la Tour d'Auvergne, Origines gauloises. Celles des plus anciens peuples de l'Europe puisées dans leur vraie source ou recherche sur la langue, l'origine et les antiquités des Celto-bretons de l'Armorique, pour servir à l'histoire ancienne et moderne de ce peuple et à celle des Français, p. PR1, at Google Books, 1796–97. 1 2 3 4 Holcombe, Charles (2011). A history of East Asia : from the origins of civilization to the twenty-first century (1. publ. ed.). New York: Cambridge University Press. p. 79. ISBN 0521515955. Retrieved 4 March 2016. 1 2 3 4 Nelson, Sarah Milledge (1993). The archaeology of Korea (Asian ed.). Cambridge, England: Cambridge University Press. p. 147. ISBN 0521407834. Retrieved 4 March 2016. ↑ Jensen Jr., John. Earth Epochs: Cataclysms across the Holocene. John Jensen. p. 276. Retrieved 4 March 2016. ↑ Meyerhoff, Janusz (2013). Misteryous Megalithic Structures. Lulu. ISBN 9781304650924. Retrieved 4 March 2016. ↑ Holcombe 2011, p. 79. ↑ Nelson, Sarah Milledge (2012). The Archaeology of Northeast China: Beyond the Great Wall. p. 16. ISBN 9781134816590. Retrieved 4 March 2016. ↑ "Krishnagiri District Website". Krishnagiri.tn.nic.in. Retrieved 2013-03-15. ↑ Briggs, Phillip (2012). Somaliland. Bradt Travel Guides. p. 98. ISBN 1841623717. ↑ Journal of European Archaeology (JEA), 5 (1997); Emilia Pásztor and Curt Roslund: Orientation of Maltese dolmens. ↑ Questioning Knockeen - Local educational website - The keyhole entrance in the image is the same one that is pictured on the website. The Wikipedia image is many years more recent than the educational website image. ↑ "The Scandinavian Contribution in Normandy". Viking.no. Retrieved 2013-03-15. ↑ Salvatore Piccolo, Ancient Stones, op. cit. ↑ Salvatore Piccolo, ibidem, pages 13 onwards. ↑ Edward Frederick Knight. Albania: A Narrative of Recent Travel - Primary Source Edition. Blackstaff Press. p. 257. Piccolo, Salvatore (2013). Ancient Stones: The Prehistoric Dolmens of Sicily. Thornham/Norfolk: Brazen Head Publishing. ISBN 978-0-956-51062-4. "Dolmen (Goindol) sites in Korea". on UNESCO's World Heritage List.